Popular historic sites such as Fremantle Prison and The Perth Mint are in your itinerary. Do some cultural sightseeing at Tyler's Vineyard and Art Gallery of Western Australia. Explore the numerous day-trip ideas around Perth: Caversham Wildlife Park (in Whiteman), Rockingham Beach (in Rockingham) and Fremantle (The Fremantle Round House & Fremantle Markets). 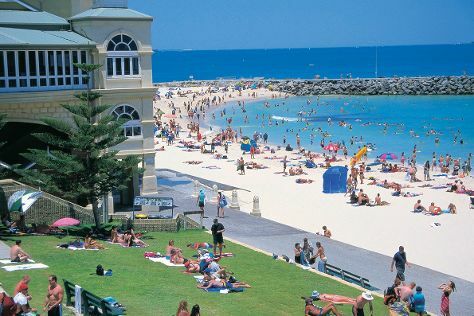 There's lots more to do: enjoy the sand and surf at Cottesloe Beach, walk around Kings Park & Botanic Garden, explore the activities along Swan River, and stroll through Scarborough Beach. For more things to do, traveler tips, other places to visit, and more tourist information, you can read our Perth tour itinerary planner. If you are flying in from Malaysia, the closest major airport is Perth International Airport. In July, daily temperatures in Perth can reach 21°C, while at night they dip to 8°C. Finish your sightseeing early on the 14th (Sun) to allow enough time to travel back home.